The plants you have in your yard have a large impact on your monthly maintenance and your water bill. Many people in North Texas are switching to native varieties for their plant choices. Local varieties are more resistant to diseases and they need less artificial irrigation. If your goal is a beautiful lawn that needs little to no maintenance and stays green throughout the seasons, find local evergreen shrubs and trees. What are the best shrubs for lining the perimeter of your house? If you look at most North Texas lawns, there’s a thick line of plants along the front of every house. Most homes even have shrubs along the sides of the house away from the entrances and patio. This is because shrubs and flower beds have root systems that lock the soil in place. They also shade the soil and keep it cooler. This is essential to protect the cement foundation and prevent any incidental shifting because of temperature changes. Tree roots are too strong to be near the foundation because those roots can eat into the concrete. Given enough time, they can even enter the pipes and. Evergreen shrubs keep the conditions the same, or as close to the same as possible, all year round. Holly shrubs, which are evergreens that are native to Texas, are the best option. Not only do they look beautiful and they stay green throughout the fall and winter so your yard has a splash of color even when the grass is brown. Other varieties of native, evergreen shrubs that you can use to protect your soil and your foundation include yucca, rosemary, and spirea plants. Using a combination of flowering evergreens and base shrubs can add layers of color and more depth to the display. It also provides more protection for the soil in the warmer months. Having more shrubs and trees also means you have to maintain less grass, which is one of the biggest users of water and irrigation. 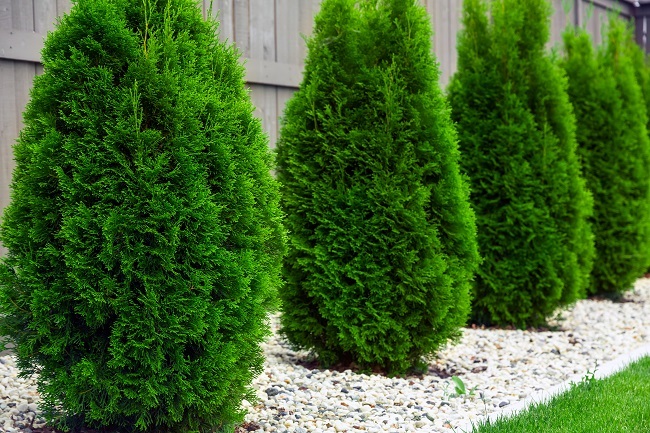 Go to Chambersville Tree Farm to find the evergreen shrubs that are perfect for your home. When Should You Stake a Tree?